In 2009, Khosla Ventures, which is currently in the process of raising money for a new fund, led Square’s initial venture round queuing up the company for its launch, and participated in Square’s Series B round in January 2011. Square’s founder and CEO Jack Dorsey said in a release: Square is thrilled to welcome Vinod to our board. We have worked closely with Khosla Ventures since our inception and Vinod’s expertise, history and input will be a tremendous asset to our company as we continue to grow. Having someone with Khosla’s entrepreneurial experience on a board is a big win for Square. 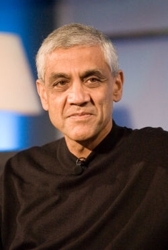 Khosla co-founded Sun Microsystems. He went on to become a general partner at Kleiner Perkins and then founded his own venture fund Khosla Ventures in 2004. Clearly Khosla has experience advising the big guys in the tech world, and this input will be invaluable for a growing company like Square. Armed with a new strategic investment from Visa, Square is on fire of late, launching a disruptive new iPad app/virtual cash register and reaching the milestone of processing $3 million in payments per day. And the company is on track to process $1 billion in payment volume within a year.